VLOOKUP from Another Sheet in Excel | How to use VLookup Function? VLOOKUP is an excel function used by excel users who usually need to work with more than one worksheet. It has the ability to extract your data from another worksheet in a very flexible and organized way. In simple terms, this function takes the input from the user, and searches for it in the excel worksheet and returns a matching value related to the same input. Speaking in a technical way, the generic definition of VLOOKUP function is, that it looks up for a value in the first column of the specified range, and returns the similar value in the same row from another column. The VLOOKUP function is available in all version of Excel right from Excel 2007 to Excel 2016. The VLOOKUP function consists of 4 parameters- lookup_value, table_array, col_index_num, and range_lookup. Let us see in detail what do these 4 parameters define in the above syntax. Lookup_value – Here the user needs to define the value which needs to be searched. It can be either a value which consists of number, date, or text or else it can be a cell reference. Table_array – Here the user will define the range of cells within which they need to search the data. Also, values searched are case sensitive i.e. it can search for values in form of text which can be upper or lower case and can find them out. Col_index – Here the value entered refers to the column within the table array in which the users need to find the value. Range_lookup – This parameter is through optional, but is an important parameter to be considered, as it returns approximate match if the range lookup value is TRUE, and returns exact matches if the range lookup is FALSE. 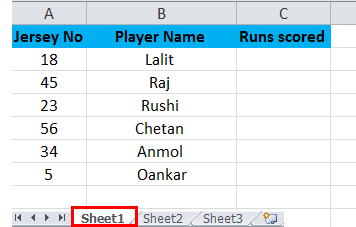 Let us consider an example as shown in the below examples, where we have taken 2 worksheets wherein sheet1 there are names of players with its jersey numbers, but with missing runs scored columns. This column needs to be extracted in sheet1 from sheet2. As we can see in example 2 above, additional columns are there such as Column C and D, when compared with sheet2. We need to retrieve data of Column C from sheet2 to sheet 1. The steps to perform VLOOKUP function are as follows. First enter the formula =VLOOKUP (A2, Sheet2!$A$2:$D$7,3, FALSE) in cell C2, and press enter. We can either type the formula in every cell, but copy pasting will be a much easier and efficient way. Let us see the steps below which will explain the above steps and formula in detail. A2 represents the lookup value which is jersey number and it’s the same value in both the sheets. Sheet2! is the name of the sheet. 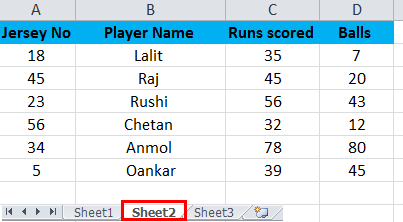 $A$2:$C$7 is the range of data in sheet2 where we are searching data for the jersey number so as to fetch the data for runs scored in the sheet2. And also the’$’ sign is used to fix the data range so it makes easier to copy and paste in other cells. 3 is the column index-number which contains data in the 3rd column in the sheet2 and will retrieve data from the range A2: C7. FALSE will return the exact match if the lookup is in range. Click on cell C2 and drag down the cell from the corner to apply the formula in all the below cells as shown in the below image. 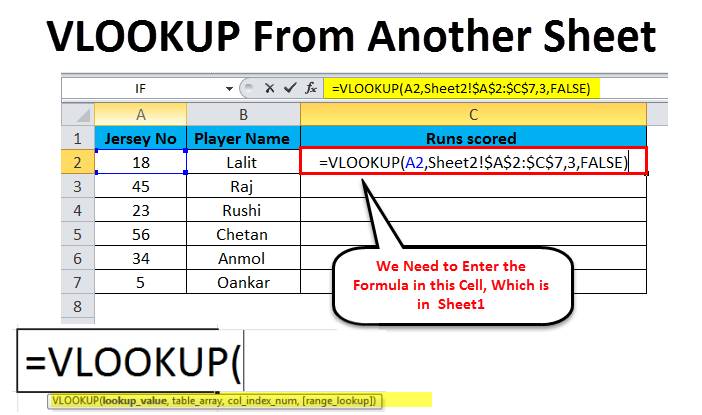 As seen in the above image, which is a snapshot of sheet1 where the column C ‘Runs Scored’ is filled using the VLOOKUP formula. VLOOK function can also be used in the same worksheet, as shown in below image. As we can see in Step 3, we have entered the formula in cell E2, to lookup value for in cell C4. Here in this formula, we have not mentioned the name of the sheet, as we are searching for value in the same sheet. A4 is the lookup value; A2: C7 is the search range i.e. table_array and 3 is returned matching value from column C.
We can see the result returned in the below image. This function helps the user to search for data in the same sheet or even in cases when there are multiple sheets present in the workbook. VLOOKUP function is much useful than the MATCH function, as MATCH function does not return the value of data, it only returns the position of that value. VLOOKUP helps the user to even extract data from one worksheet to another worksheet. Also, the most important feature offered by VLOOKUP function is that values can be looked up from different workbooks as well. The main advantage of VLOOKUP function is when the user types text in order to be searched, it does not check whether the text is lower or upper case. As the function is not case sensitive. It is difficult for a new user to understand how the formula is implemented, and to know about the parameters involved in it. In case if the user is performing an approximate match, then the first column of table_array needs to be sorted in ascending order. If not it will return the correct value. Hence, this function needs to be executed with proper knowledge of the formula. The VLOOKUP function never searches for the data in the left. As it always takes up value for the lookup value in the leftmost top column and starts the search from left to right. Always remember, when we enter a value less than 1 in the col_index_num parameter there will be error returned by the formula. For efficient way, use the symbol ‘$’ (absolute cell references) for the table_array parameter so that the user can copy and paste the formula in other cells without any error. Also, there is no need to type the entire formula, as when it comes to the part of entering sheet name, you can switch the sheet and select the range using the mouse.